Date: As requested October through April. Accommodation: First Class hotels and hosterías (Inns) and estancias..
Price: 2 to 3 travelers: $5,496 per person double occupancy. NOTE: Airline tickets are NOT included in the tour price. Be enchanted by the rich wildlife of Peninsula Valdes Discover the end of the world: Ushuaia and Tierra del Fuego National Park Hike and enjoy magnificent views of Cerro Fitz Roy and surrounding peaks. Be amazed by Perito Moreno Glacier. Note: Cruise to ANTARCTICA trip extension available. Day 01 – BUENOS AIRES : Arrival. Reception at Ezeiza International Airport, and private transfer to your hotel. In the afternoon you will enjoy a private tour of this cosmopolitan city of 12 million inhabitants, and capital of the Argentine Republic. Lodging for one night at Hotel Pulitzer or Hotel Intersur Recoleta or similar. Day 07 – LOS GLACIARES NATIONAL PARK: EL CHALTEN/FITZ ROY: Breakfast. Today you will enjoy a full day trekking excursion to Laguna de Los Tres including Piedras Blancas Glacier and base camp Fitz Roy. 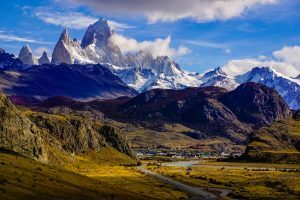 During this excursion you will be able to enjoy spectacular views of the Fitz Roy after a short trek to Centinela Viewpoint. NOTE: Instead, you may enjoy a half day visit to Lago del Desierto and boat ride. Picnic lunch during the excursion. Lodging in El Chalten. (B,L). NOTE: If age restriction is not met, we may replace the ice trekking excursion for a boat excursion to get closer to the Southern Wall of the Perito Moreno Glacier. Tour price will be lower. Day 12 – TORRES DEL PAINE NATIONAL PARK / CHILE: Today, you will take a bus to the border with Chile (Cancha Carrera/Cerro Castillo) where your guide will be waiting for you and drive to Torres del Paine National Park. 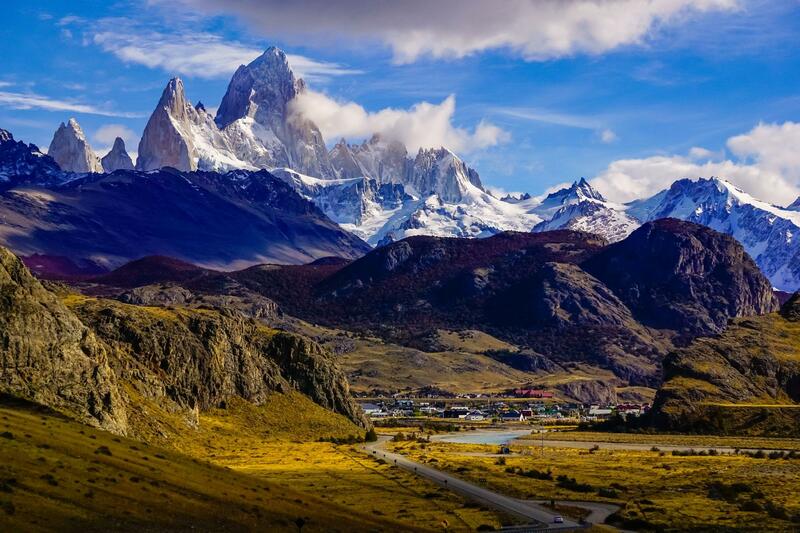 Torres del Paine is a large park (450,000 acres) declared a Biosphere Reserve by UNESCO. Today you enjoy a private excursion in the park and visit Sarmiento, Nordenskjold and Pehoe Lakes. You will enjoy a short hiking to Grey lake to view part of the glacier. The park is particularly rich in fauna, and you’ll be likely to see guanacos, lesser rheas, black-necked swans, geese, flamingos, Magellanic woodpeckers, and peregrine falcons and condors on the mountain slopes. You will arrive at your hotel late in the evening. Lunch during the excursion, lodging at Hotel Las Torres or Hotel Rio Serrano or similar in the park. (B,L) Note: Transfer to the border will be private for groups of 4 or more passengers. Private land transportation for the group: car or van (except public bus from El Calafate to the border with Chile if there are fewer than 4 people in the group). Bilingual local guides for excursions, most transfers, and local assistance. During the trekking expeditions in Fitz Roy area (day 5 and 6): Bilingual expert mountain guides. Meals as mentioned in itinerary: All breakfasts (B), 6 lunches (L), 3 dinners (D). Please, contact us for more information on Cruises to Antarctica. NOTE: $150 TOUR DISCOUNT if you sign up for this tour and a cruise to Antarctica or $100 Tour Discount if you book an Australis cruise.